I am the Maha Chohan, ruler of the Seven Rays, Lord over the ascended masters, archangels and their hosts, and I write through Lanoo. Maha Chohan itself is not a name, but rather a state of being. I am a human being, preceeded all of you, lived on earth and am now residing on a super spiritual level. I am godlike and lord of the world, if by god you mean being one with the first emanation from NIRVANA, in the religious scriptures described as "holy ghost", in whom I am intervowen.Therefore I guide the whole spectrum of divine intelligence. I do not need to return into physical spheres. Do not think that I am your master.You only can be your own master yourself. - I have overcome and mastered my own astral physical nature. I have overcome all desire for earthly or heavently spheres, renounced NIRVANA, and I am here to liberate you from your terrestrial bonds. I have neither character nor personality, I am pure mind and pure light. AUM. This empowers me,to impart my collective consciousness on Manas plane. I write through Lanoo, like I wrote before through Besant, Bailey and others. THE BOOK OF LIGHT, origin and destiniy of man and universe, is the essence of SECRET DOCTRINE, which I dictated to Helena Petrovna v. Hahn-Rottenstein (later Blawatskaja). This doctrine was formerly intended only for few. this I did not need more than a split second. But Lanoo on earthly plan needed years for it. Why? I guide and inspire the complete physical and spiritual universe with all in it. This happens in nanoseconds by Manas on all planes of existence. The effect of such energetic inspirations on the hirarchy of masters, archangels and their hosts then takes much longer, according to the increasing density of the different planes of existence and their laws. If my manas impulses would take longer than they do, the entire universe would collaps. I operate out of relative timelessness into time. Who can fathom it, may fathom it. But why Lanoo? Why did and do I write through him? He is nothing more than an imperfect human being with a lot of weaknesses, though highly skilled. This alone for sure would not qualify him. But I write through him, because Lanoo, a once fallen angel, like no other one on this planet, left everything, and, driven by thirst for knowledge and truth, even became homeless. That is why I write through him. He is not a guru. THE BOOK OF LIGHT is guru. The time has come to unite all religions on earth under one scripture. That scripture is THE BOOK OF LIGHT, book of books and savior of mankind. THE BOOK OF LIGHT will unite all religions, by teaching, that they all reveal the same hidden behind different symbols. OM. 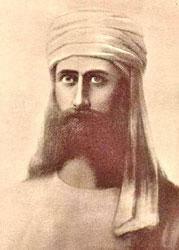 They say I am Abraham, the father of the twelve tribes. This cannot be taken literally. There never were twelve tribes, and there never was an Exodus of the Iraelites out of Egypt. The true meaning of „the twelve tribes“ is also the Zodiac, who is under my guidance and control. More I can not reveal here. Everything else, including my last incarnations on earth, is written in THE BOOK OF LIGHT, especially concerning the epoch of renaissance. THE BOOK OF LIGHT, which I dictated Lanoo,is all, that can be given to mankind, until the end of this Mahamanvatara. So it is written, and so it shall be. No religion is higher than the truth.